Verata Goats are fairly easy to handle. They are kept for their milk and meat, and are very adaptable to many management systems. Being extremely hardy, they can survive in many temperature variations. With extremely good feet and legs, Verata Goats show off their true ability in mountain pastures, where they can survive on poor or scarce feed. 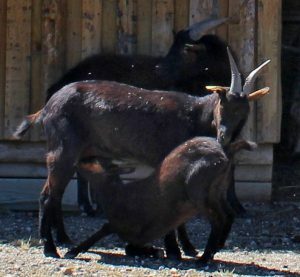 At maturity, male Verata Goats stand around 67 centimeters at the withers, and females are shorter, around 63 centimeters. Males weigh around 67 kilograms, and females are about 48 kilograms. They have glossy, short hair that is usually a shade of brown or black. Chestnut is especially popular, and this color comes with a black underbelly, inner thighs and axillae. Generally, a black dorsal fringe and cervical frame are also present, along with a black facial fringe. Often the muzzle, ears and tail area are a lighter shade, usually white. The faces of Verata Goats are straight or dished, and the heads are triangular shaped. They have tassels and carry their ears horizontally, and the beard is prominent in males and forty percent of females. The horns of Veratas spiral upward and outward, and have forward pointing tips. Their ribs are well sprung, topped by level backs which slope upward toward the pelvic area. The straight legs of Verata Goats are thin enough to have joints that seem very large. They are straight and end in dark, hard hooves. The tail is carried straight up in the air, and the sexual organs are well developed. On the udder, Verata Goats have teats that point downward and forward. Lactations last around 175 days, and yield about 150 liters of milk. When kids reach seven to nine kilograms or 45 days of age, they may be slaughtered for meat. Verata Goats derive their name from their home of Vera in the Caceres region of Spain. They are especially valued for their milk, which is used in cheese production both at local farms and at centralized cities. There are about 17,000 Verata Goats living in Spain. Verata Goats have traditionally been raised in transhumant systems and do very well under such conditions. They are moved from lowland pasture to medium altitude mountain ranges, generally in herds of 100 to 150 goats. In the winter when graze is scarce, Verata Goats do very well on concentrated feed in stabled environments. 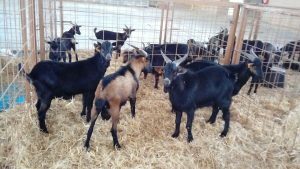 Although Verata Goats breed year round, owners attempt to structure the breeding around times when kids are highly marketable. Thus, Verata Goats generally breed in October and November and again in the spring, around March. They usually have single or twin kids, and fertility is very high at around 95 percent! Under good conditions, Verata Goats can have three births every two years.